now that the weather has turned a little cooler. Is it fall where you are? 85 degrees forecast for today!! 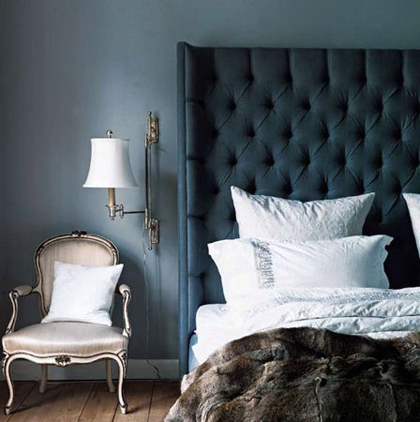 I love the bedroom, the light is gorgeous and the headboard is so stunning. Is it fall? It sure feels like it!! The Hubs like to refer to it as 'wine season' though, LOL! Loving the dark too, an upcoming project I am doing is going to have lots and lots of dark elements...very excited about it! It is definitely not fall yet in North Carolina, all though this week we will have a day when we don't see temps in the 80's for the first time so there is hope! I love that bedroom, it makes me want to sleep in! I really love the yellow in the rug! It is a great contrast and grounds the darker space with warmth! No, in Dubai it's still 41C so our fall won't be until Christmas! Come on cooler weather! This bed looks to be the perfect place to creep into these chilly September evenings. Had no time for blogging last week. Thank you for your nice comment - you will see more of me this week! These rooms are so inviting. A place to curl up with a good magazine. Still hot...but I do love this! hi donna, I get your blog everytime you post and LOVE it, it is one of my favorites! I just became your newest "google" follower now, and if you are ever in the "neighborhood" come on over and visit me at "myoldcountryhouse.blogspot.com" best regards...you are doing beautiful things! that bed is gorgeous! leaves are just starting to turn here and the mornings feel very much like fall! I'm ready! The peach and dark tones are so appealing. Also, love the balance in the selection of pieces with the art in second photo. As the days get cooler, this type of room really draws me in. My walls are this color. Love them. It almost never is fall where I am...SW Florida. It will be in the low 90s all week. 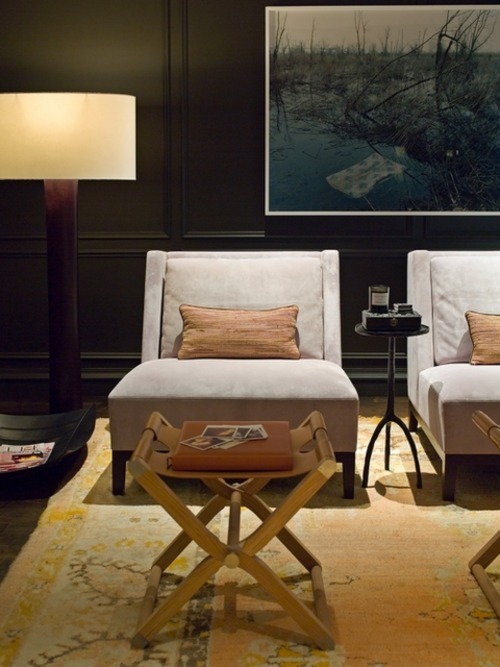 I love the second image; the dark walls, perfect chairs, Giacometti-style side table and the rug with all its luscious, understated colors. Sublime. Donna. It is still warm, cooler in the evenings, fall is on its way. Adore the rich colors, and yes that yellow rug is so gorgeous!! Oh girl, I'm with you. It's still 90 degrees in Dallas, but the clouds are gathering and the gray is penetrating the heat. I'm so ready for dark moody fall to break through. Fall is totally where I am. Love these images, Donna! my dear friend... you are so kind... thank you for your kindness... you are such a treasure in my life.. I love these pictures. The head board in no 1 is a dream!! Marshall and I have both drooled over this image so many times and it is kept safe in my style files for that one day when..